Natural bone. 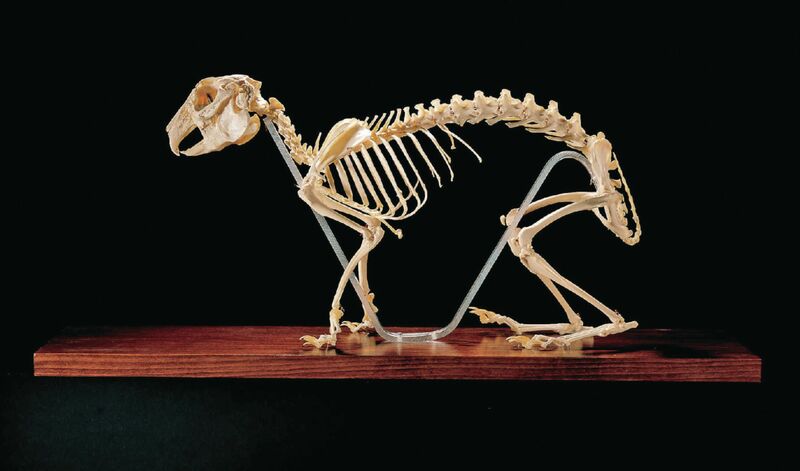 Strong incisors for an herbivore diet and powerful hind limbs for speed make the skeleton of the common rabbit, Oryctolagus cuniculus, an ideal example for relating structure to function and for demonstrating adaptation. The two sets of upper incisors distinguish the Lagomorphs from rodents. It is mounted in a normal position on a wooden base and attached by a clear plexiglas support. It comes with a key to identify structures. Base size: 223/4"L x 51/2"W. Skeleton size: approximately 15"H.